One of the most seminal bands in sludge takes another swing at your skull with their sonic sledgehammer. GRIEF is a band that I've had the privilege of being abused by for almost a decade and not once have they failed to do anything but pound me. Their inimitable formula has oft been replicated by bands across the globe but GRIEF has yet to really be surpassed for sheer audio severity. 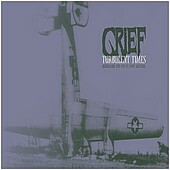 This CD is a collection of tunes from their early demos through their much sought after 7 and 10 inch splits with bands like 13, DYSTOPIA, CORRUPTED, 16 and SOILENT GREEN. This CD is so heavy it has a discernable gravitational field. It wouldn't surprise me if at the center of the universe's black holes there weren't collapsed stars, but rather GRIEF albums.